Are you going to refill air into your tires, but you have no idea what tire pressure you should have for your vehicle? That’s a pretty common question and the answer for this question can be both advanced and simple. 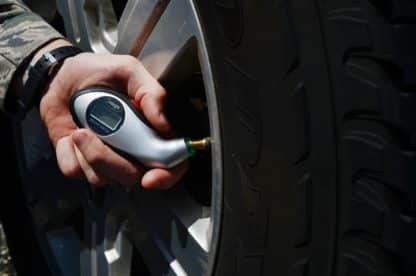 In this guide, you will learn both the simple and the advanced way to figure out the tire pressure for your tires. 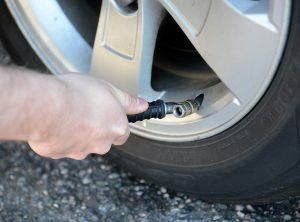 How to find the right tire pressure for your car? You may be looking at that label and don’t understand anything at all, but don’t worry I will explain it all to you. The first thing you have to check is what size you have on your tires. 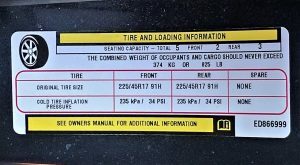 Because on the most labels, there are many different tire sizes. You will find anything like 195/65 – 16, that’s the size of your tire. 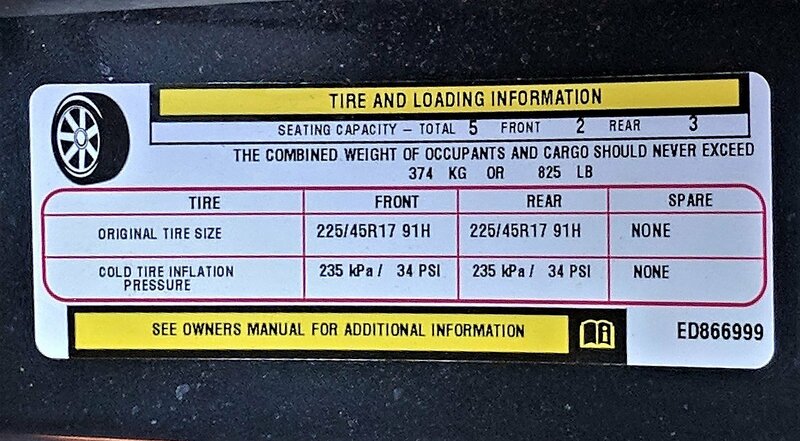 When you know what tire size you have you can just check the label. What do cold tire inflation pressure mean? How much the difference depends on the tire size etc, but the difference could be around 0.4 bar ( 6 psi ~ ). 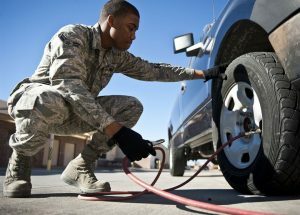 How can I check the tire pressure myself? You can either check your pressure with a tool at home or drive to a shop that will check it for you. If you want to check it yourself sometimes you can get a tool like one in our article Best Tire Pressure Gauge. It’s not expensive at all and can be really good to check your tire pressure with periodically to make sure that you are not driving around with too low pressure. If you want to fill your tire you should use compressed air. You can find one at a workshop or probably at your local gas station. My label has different tire pressure depending on how many passengers and load? Yes, most labels have different pressures depending on how much load you are going to have in the vehicle. What’s better, Over or Under the recommended pressure? I always recommend driving a bit over the recommended pressure. In older tires the was worn out in the middle of the tire thread if you were driving too much pressure, but with newer tires, I don’t see that happen if you don’t drive with an extremely high pressure. Around 0.1-0.3 bar ( 1-4 psi ) over is no problem. In fact, I have seen in several newer vehicles with a tire pressure warning that if you read for an example 2.5 bar ( 36 psi ) and you try that. It will still give you a warning message because the tire pressure should be OVER that value. So what’s happening if you fill it with 2.6 bar ( 38 psi ) when the tire is warm? Yes, the warning light will come back when the tires are cold. So in general always add 0.1-0.2 ( 1-3 psi) more pressure than the label is telling you. I use aftermarket rims & tires, how much pressure should I have? Either you can ask the one who sold the tires or you can check this list for a general tire pressure chart. I don’t recommend it, your car can wear out the tires faster and you can get less control over the car. But it is a good benchmark to know roughly what tire pressure you should have. Remember what I told you before, it’s often better to have a bit more pressure than having too low pressure. Big Sized car normal tire size( around 265/45 – 18 ) 2.9 bar ( 42 psi ). In general, if you have bigger rims with a lesser tire profile you should use higher pressure. You should never drive around with too low pressure, you will damage your tire and probably the rim. Your car will also require more fuel because it won’t roll as easy as with the right pressure. It’s also dangerous because you will have a lot less control of the car at higher speeds. It’s always better to have a bit higher pressure. Lesser pressure can be good if you are looking for more grip at lower speeds. I hope you like this short guide if you have any more questions that didn’t get answered you can contact us. Let me know if you like this guide by leaving a comment below. If you want us to add or change anything, let us know! See you in the next article!